We say that with a Nosh we aim to cook a meal appropriate for a special moment or celebration, so it's great fortune when the calendar aligns with a festival — and even greater when it's the biggest of the year in the country. Persians have been celebrating Nowruz, the festival of the spring equinox, for millennia, and specific foods play a central (and delicious!) part of the rituals. 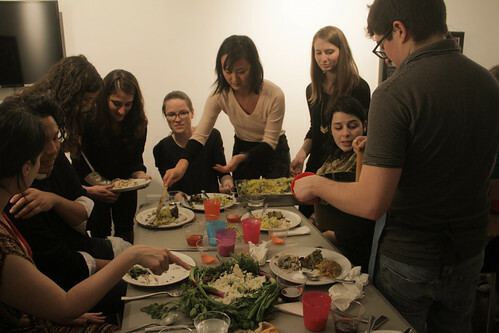 Nowruz felt to me somewhere between Passover and Thanksgiving, a holiday tightly linked to many specific foods with imbued meaning. Helping us through this ancient tradition was Sophia. She brought many of the elements of the haft seen, the traditional elements; helped cook some of the dishes; and provided moral support by insisting that Iranians are very inventive so every little mistake or forgotten item wasn't a big deal and could be creatively substituted. 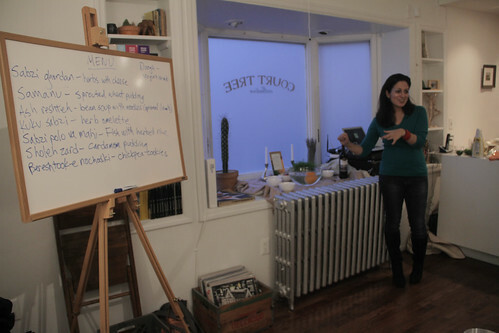 We also got useful menu-planning help from Arya. Thanks to you both — and to everyone who pitched in to help serve, clean, and otherwise help out. As with the India meal, we noshed at a rented space, so we could accommodate twenty people, including Laura's dad, Lyall! I must say this one went more smoothly than India, mostly because I learned the lesson to not cook too many dishes at once. I should also note that I broke with my habit of using recipes found online. Everything I cooked is from Najmieh Batmanglij's Food of Life, which offers not only clear and tasty recipes, but also history, culture, and even fables to bring fuller context to the meal. Where possible I've linked to either the exact recipe I used, or found something similar. Sofreh haft seen | Display of the seven "S's"
Moreso than a seder plate, there are many popular traditions of extra items to add to the core. The variation I can think of, and the only one the Wikipedia page on the seder plate lists, is an orange. In fact, one of the haft seen variations involved an orange — but floating in a bowl of water, representing the Earth in the universe. (I guess Zoroastrians didn't believe the Earth was flat?) Another common tradition is a goldfish, representing both life and Pisces, the astrological sign whose time ends on the spring equinox and hence the end of the year that Nowruz begins. According to Sophia, you'll see a goldfish in many Persian households in spring and summer, as a houseguest that arrived on Nowruz. Since neither she nor I could commit to a goldfish, we didn't get one. Alcohol is forbidden in Iran, but the place has a long history with drinking. After all, Shiraz, that inky wine, is named after a Persian city. This cocktail is a lovely way to build a drink around rosewater. The gin stands up to the strong aroma, the cherry liqueur adds color and roundness, and the lemon of course brings the tart. (We couldn't find sweet lemons anywhere, so we balanced with some extra lemon and also a bit more sugar.) 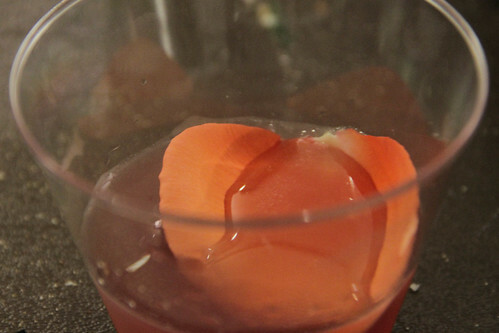 With a rose-petal float, it was quite the classy drink Laura whipped up! We first enjoyed this drink with the Afghan meal, but I have to say I like the Persian version better, minus cucumbers and plus seltzer, and with this silky-tart yogurt as opposed to something lumpier. I might even whip this up again in a few months when I'm seeking relief from the heat! In Iran, like so much of the world, few people bake at home, and rather let someone else deal with the toil and the heat. 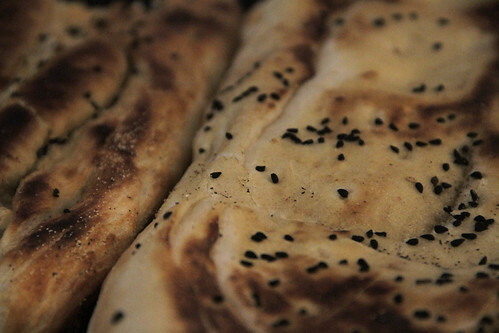 But I like baking bread, and other than lavash it's just about impossible to find Persian-style breads here. I particularly enjoy working with a dough that has oil in it — it's easier to work with, the goopiness is kinda fun, and of course the end flavor is rich. Since I cracked my pizza stone a while ago, I cooked the breads one at a time on a metal griddle in the oven, which definitely worked to get the bread crispy, but also ended up charring the cornmeal that accrued after several loaves and led to a bit of a smoky condition. Oh well, the bread worked great, and was a fantastic companion for the cheese. 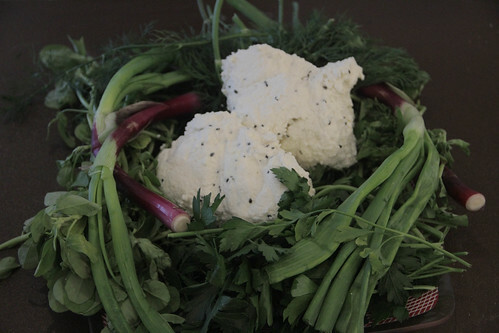 With this platter we see the first of many appearances of herbs in the meal, which Persians love year-round and especially for the rebirth and freshness they represent for Nowruz. This rich yet healthy stew of beans, lentils, herbs and noodles is as indispensable a part of Nowruz as the turkey is to Thanksgiving. An abundance of fresh greens — parsley, spinach, dill, green onion — of course makes this dish representative of springtime, while the dried legumes and buttermilk (traditionally of a variety that's dried for long-term storage) acknowledge that heartier fresh fare is yet to arrive. 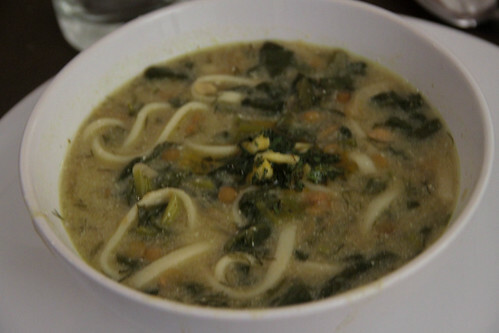 But most symbolic is the noodles, which you eat to "symbolize the choice of paths among the many that life spreads out before us." But enough about embedded, how does it taste? Really good. I used a rich chicken-and-lamb broth which lent a lot of depth, and made the legume base the day before, so there was a lot of concentrated flavor. Tangy yogurt (I left the dried buttermilk at home!) and fresh herbs brought zing and aroma, and the garnish of garlic, turmeric, mint and olive oil made sure the first few bites woke up the palate. 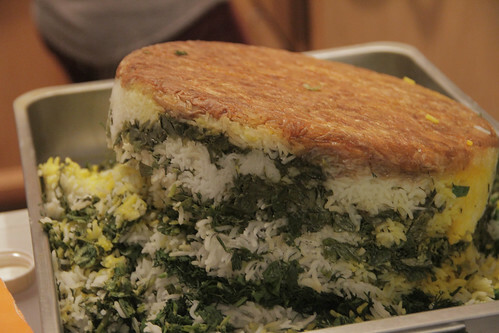 The rice is cooked in the peculiar Persian style: basmati rice washed five times, soaked in salt-water, vigorously par-boiled in more salt-water, drained, and then formed into a pyramid on top of a crust-base, then steamed in the residual moisture for a good long while. Let's back up to that crust-base, known as a tahdig: Persians expect that the bottom of their rice will be crispy and caramelized, so it's common practice to make a layer of oil plus something to crisp up (lavash, potatoes, yogurt) at the bottom of the pan. A gracious host will give the best crispy pieces to honored guests. The sabzi polo, or herbed pilaf (polo, pilaf, same thing! 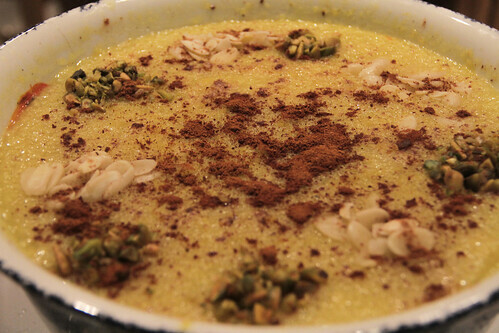 ), takes this concept and layers in lots of herbs plus saffron water. I accidentally put all the saffron water on the rice, rather than reserving most for the fish as the recipe says, but I rather like the way the heavily saffron'd rice turned out! The fried fish is simply pan-fried, though optionally dusted with some intriguing flavors, such as the turmeric and cinnamon the book calls for. I went with striped bass in filets, though you could do any white-fleshed fish and having it cut into steaks is perhaps more traditional. 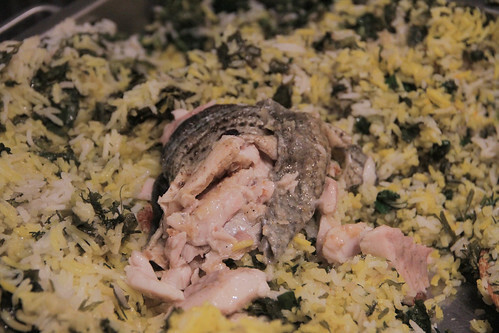 Either way, it's a tasty dish with crispiness all around between the fish and the tahdig! 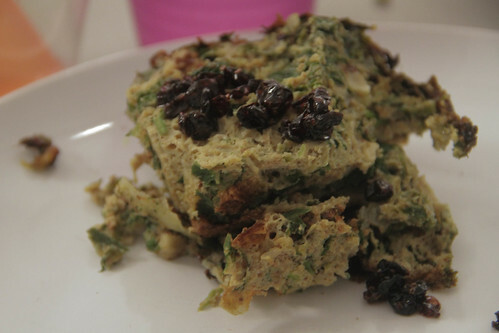 Here eggs, that incomparable symbol of the circle of life, make a bold appearance, accompanied by two other favorite Persian ingredients, walnuts and barberries. The berries, known as zereshk, are so tart you don't really want to eat them straight, but once soaked and sautéed they're ready to balance the eggs and the herbs. Those walnuts add some crunch to what we'd expect to be a thoroughly soft dish. This is also the only dish with essentially zero flour I've ever seen that uses baking powder, which indeed serves to leaven the frittata all the more. Unlike a Passover seder, most of the items on the haft seen spread aren't eaten, but this pudding made of sprouted wheat is the exception. Yes, it's yet another manifestation of growth and rebirth — but also transformation. 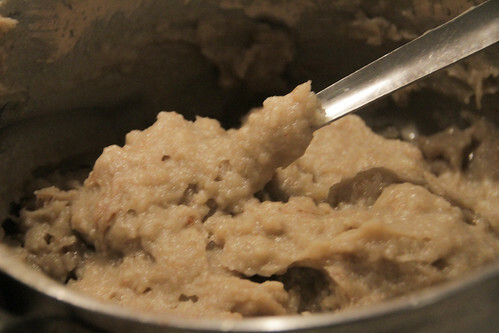 Samanu takes days, and a lot of labor, to make: you need to sprout whole wheat kernels for a few days until it gets a bit sweet thanks to malting, grind them up with water, extract every little bit of flavored you can by pressing through a sieve, and then comes the really tedious part of stirring this malt-water with flour over a super-low flame for several hours until it thickens and caramelizes. I wouldn't say the flavor is amazing, but considering the only ingredients are wheat and water it's sweeter and more complex than I'd have imagined. This ancient dessert is so important to Perisan culture that it's the first of many dozens in the Food of Life cookbook — continuing our metaphor, maybe it's like the apple pie of Iran. It's a fascinating blend of a classic peasant technique for stretching food — simple rice cooked in a lot of water to make it more filling — with some of the most expensive ingredients like saffron and cardamom, making it at once comforting and exotic. A healthy dose of rosewater helps make it special for ceremonies and holidays, the butter makes it stick to your ribs and banish any possibly remaining hunger, and the cinnamon and nut decoration makes a feast for the eyes, too. This dish was super tasty and just about all of the enormous batch was eaten, but keep in mind it takes a long time to cool so make it well in advance of serving. This turned out to be really similar to the burfi I made for the India meal, shortbread-like, semi-sweet, lightly oily squares. 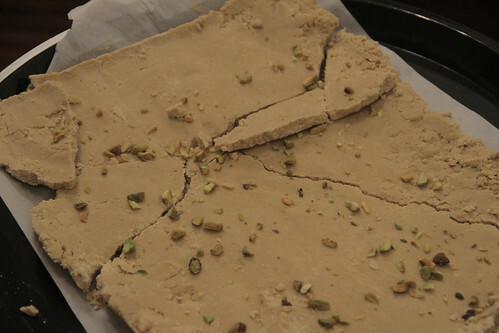 Whereas with the Indian version the butteriness came from ground cashews so the dairy was dry milk, in the Persian version it's the chickpea flour that's dry, and ghee brings the moist fat. In both cases it's little more than mixing with powdered sugar (with a splash of rosewater to make it indelibly Iranian), rolling it out, and cutting it up. Easy, and tasty.